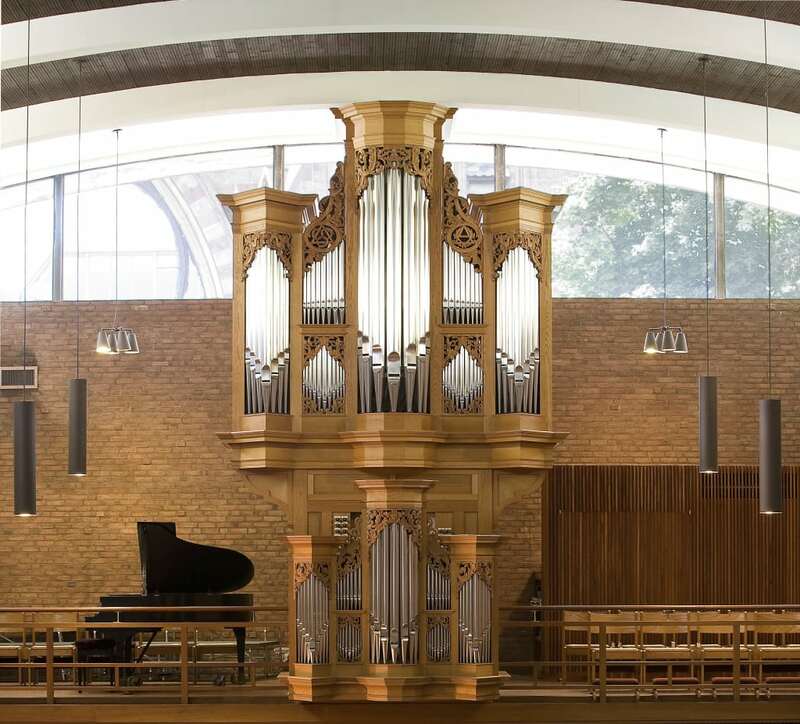 In the 1990s, the congregation of The First Lutheran Church in Boston sought to replace its aging pipe organ built by Wicks with one that would compliment the traditional Lutheran orthodoxy preached and practiced by its members. One of the major drivers behind this initiative was the congregation’s desire to create a music-based outreach program that targeted the greater Boston community. The congregation would use the rich heritage of Lutheran music to share God’s word with others, a concept that has long been part of the Lutheran tradition. In 1995, under the direction of organ consultant William Porter and Minister of Music Mark Meyer, discussions began for a new mechanical action organ. After a nationwide search, Richards, Fowkes & Co. of Ooltewah, Tennesee was selected. The organ was completed in 2000 as the company’s tenth instrument, and has since gained a reputation as one of the finest Baroque organs in New England and one of the best instruments in The Lutheran Church—Missouri Synod. The ornate case, designed in the North German style and constructed of white oak, contrasts with the linear architecture of the nave, not unlike an antique work of art placed in a modern museum. The organ is voiced with a gentle, vocal quality ideal for the accompaniment of congregational song, and it renders the organ repertoire of the historic Lutheran tradition with the utmost authenticity. There are seven independent reed stops over the two manuals and pedal, including three in the Rückpositiv. In 2010, the organ was completed with the installation of the 8′ Vox humana, the 4′ Schalmei, and the 2′ Cornet following a fundraising campaign and the generous support of William Porter and Jane Wilson. At this time, the organ builders also donated the Vogelgesang. In 2018, the organ was thoroughly regulated and the Cimbelstern was rebuilt.